Maybe this is why the boat felt slow …. 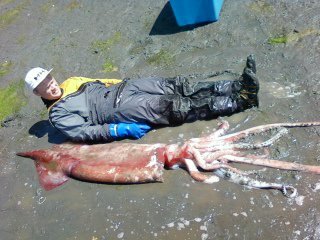 Saw a post this morning on a rather large Humboldt Squid that washed up onto a beach on Discovery Bay. The best quote from the article might be “There are numerous reports of the squid attacking fishermen when hunted, and it is a predator to some creatures.” Maybe sailboat keels? Geoduck farmer Peter Downey called to tell me that he found an 11 foot long Humboldt Squid (Dosidicus gigas) washed up on his beach on the 26th! The squid is not usually found around these waters, but one was caught about a year ago, if my memory serves me well. Downey has a commercial scale, so he weighed the thing in at 59 lbs (!). The squid is usually found in very deep water, and has been expanding it’s territory north. You can read the entire post on the Olympic Peninsula Environmental News site here.